Yesterday in Atlanta, we gathered our men together for a time of crafting community and learning. Clay Scroggins, the Campus Pastor for Browns Bridge Community Church, shared a message on “How to Lead When You’re Not in Charge”. The content shared was both poignant and practical. Below is our ‘net out’ of what Clay said. The majority of us will never be in charge of a large organization. We’ll never be a CEO or Executive Director. But there is a lie that accompanies this fact. The lie says, “until I am in charge, I cannot lead. When I am in charge, then I will lead.” We believe organizational positions directly correlate to our leadership abilities. But if we believe the precept that leadership is influence, we must also know we all have influence. It starts with me. I can never be led better than I am leading myself. When I wait to be led, I diminish my influence and lose out on opportunities in front of me. Leading means knowing when to follow, monitoring my heart and behaviors, and making a plan for my own development. I can only control myself. The intangible benefits of leading yourself well are that you will become easy to lead, others will have a desire to lead you (they may even fight over having you on their team), and you’ll become the quickest to lead next. At every level in your organization, get leaders to constantly think, “how can we make it better?” Stop thinking like an employee and start thinking like an owner. Thinking critically is a skill, but being critical is a snare. By being fully present in relationships and environments, critical thinkers have a high ‘with-it’ factor. Every level in an organization has information, experience and perspective that affects its direction. Intentionality is the enemy of passivity. Learn to reject passivity while you are under authority, and you will become a leader who is actually worthy of authority. No one will ever be fully in charge. No matter where you are in life, you can learn to lead yourself, choose positivity, think critically and reject passivity. If you do all of these things, you just might find yourself in charge of more. 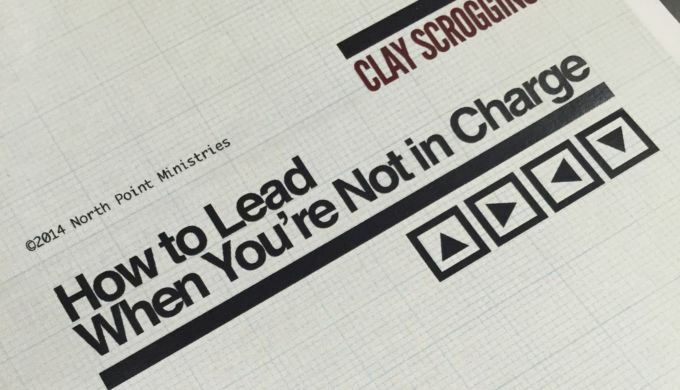 Be sure to follow Clay on Twitter and listen to him talk about Leading When You’re Not in Charge on the Andy Stanley Leadership Podcast! I especially like “Reject Passivity.” Unfortunately traditional church services teach Christ-followers to be passive — to just sit and listen to the same speaker week after week. Perhaps it is time for church to reject passivity and allow ordinary believers to share in meetings as led by the Spirit. We have ‘de-volved’ church in many ways, mainly by ‘outsourcing’ the work to paid staff and letting ourselves off the hook for intentional disciple-making. That’s my two-cents.